Last summer/fall I had a wonderful opportunity to transform an abandoned greenhouse attached to the Wells College Book Arts Center into a functional paper-making studio. The space was calling my name the second I arrived on campus 2 years ago. I slowly began to collect material, receive donations, and build equipment. As last spring semester was coming to an end I received a grant from the Edward Family Foundation to complete the entire transformation. The timing could not have been more perfect. I had simultaneously received approval from the curriculum committee that my Intro. to Paper-making Class proposal was approved for the Fall semester. This allowed me to work on summer in order to get the space prepared for the students. Please enjoy the gallery of photos to see the transformation and the projects that took place during the Fall semester. I can still remember the first time I heard about Penland. I was in undergrad at Old Dominion University and my printmaking professor said he received a grant to take a letterpress printing class at Penland. He raved about his experience creating a lasting impression. Seven years later I received a brochure for the summer classes at Penland and saw they were offering a papermaking class. I was in the beginning phases of adding papermaking to the curriculum and building a papermaking studio at Wells Book Arts Center. This class was perfect for me to refresh my papermaking skills. I was honored to receive a full Windgate Scholarship with a work-study position in order to take Cynthia Thompson’s Within the Sheets: Contemporary Watermark Class. For those of you who have never heard of Penland School of Crafts it is located 30 minutes outside of Asheville, North Carolina in the middle of breathtaking mountain views. 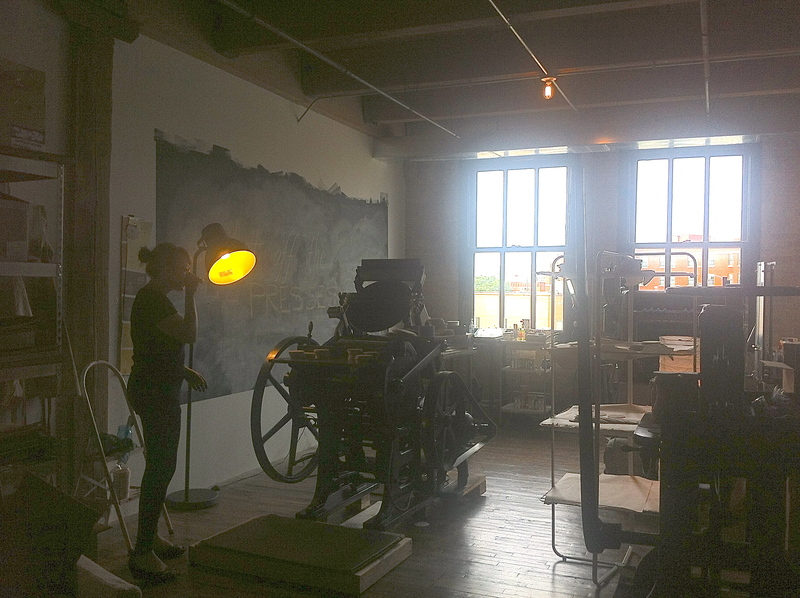 It was founded in 1920 and has a variety of studios including: clay, printmaking, bookbinding, weaving, metals, wood, glass, papermaking, jewelry, iron, and drawing. These two weeks were unlike any other I have ever experienced. It was extremely inspiring and motivating. I felt like a kid again at summer camp with no responsibilities except to make art and wash dishes. The bells would ring and I knew it was time to eat. Because I was a work-study student I had to clean dishes after meals but had two days off a week. The second best part besides making art was working with thirty-five other work-study students from every other discipline. Things that happened with the work study students: we created bonds like no other, we learned about the different studios, we appreciated nature, we saw what each other was making, we were inspired by each other, we had bonfires, and we drank wine till wee hours chatting about art and life. I am very grateful for this opportunity and I am honored to be able to pass on the papermaking knowledge I learned to my students at Wells College. Thanks to the Edward Foundation for the grant to be able to build a papermaking studio at Wells College. After returning from Penland I have been busy building and constructing the future Wells Paper House. A future blog will be posted about that process. Taking this class has given me a new perspective about handmade paper. I was able to complete all the pages of a book. Now all I need to do is letterpress print the text. I was also able to create a prototype edition of handmade paper that will be a portfolio accompanied with the current book I am working on called “Mementos From The Road.” There are a variety of techniques to create a visually interesting and beautiful piece of work within the sheet of handmade paper. I am now able to look at handmade paper as an art form and not just a medium. Wells College is a very special place and I already know from my short time here that it will always have a special spot in heart. I can definitely say this was my first experience of teaching at a college of around 550 students. It is a different experience from a larger college or university and very different from my own college experience. You create a bond and relationship with your students like no other because the max class size is 10 students at least for the Book Arts classes. Teaching with students from all disciplines was a little bit of a change for me. After the first or second class I had to rethinking my entire way of teaching, realizing I only had one student as a studio arts major. I had to incorporate foundations that I thought they would know. This was a challenge but I enjoyed trying to problem solve . I have definitely changed my entire approach for the spring semester and I am already seeing better results with my students. Learning and problem solving were the two major things that took place in the fall. I was new to the school as well as the Book Arts Director Richard Kegler. We both worked together to make things happen. Every day we found a new interesting object (books, type, prints, presses, etc). It felt like an archaeological dig site for us! Every day we were exploring new parts of the building and trying to put the pieces together from the past predecessors. We have gotten the Wells College Press Store up and running again. We also have a blog which is where I have been doing most of my posts Wells Book Arts Center Blog. Wells College Press is currently co-publishing a book with Starshapped Press called An Alphabet of Sorts. It will be released in late spring but you can check out the book on either website. The Book Arts Center has a greenhouse attached to it and has not been put to very good use in the past so Rich and I are in the process of transforming it into a paper making garden and lab. We had April Sheridan from The Center for Book and Paper Arts at Columbia College Chicago come out and give students a lecture about her experience of building a self-sustainable paper making at Columbia. By fall semester we will have the paper making garden up and running and offering our first paper making class in the fall! 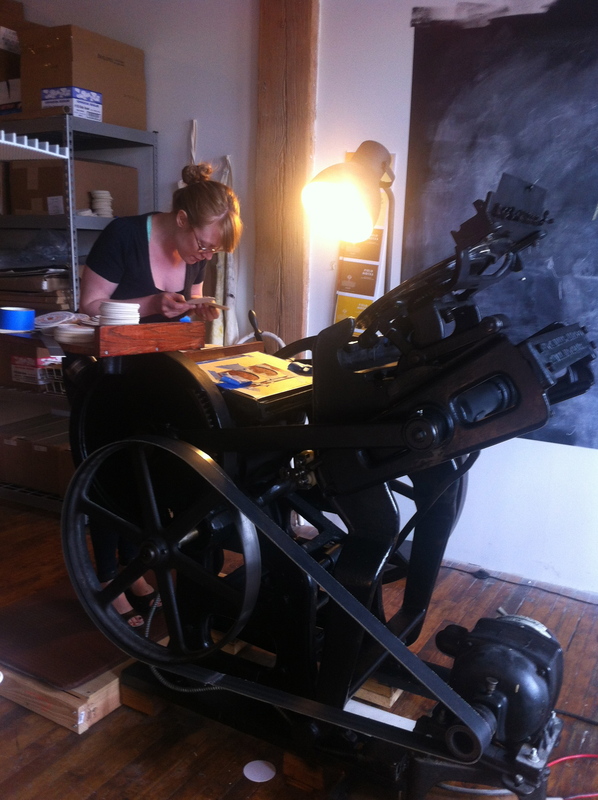 Lots of exciting things are underway at the Wells Book Arts Center. Stay tuned. New State, New Home, New Job, & New Adventures!! It has been far too long since the last time I wrote a post. The past couple months have been a little hectic! I am very honored to be the 8th Victor Hammer Fellow at the Book Arts Center at Wells College in Aurora, NY. A few weeks ago I said goodbye to Chicago. I packed my bags, my car, and my art to start a new adventure in New York State. It was a great little road trip. My mother and nephews did the drive with me and we made a pit stop at Niagara Falls and Western New York Book Arts Center in Buffalo. This semester I am teaching bookbinding. I am excited to be back in the studio and hopefully start producing new work. This post is a few weeks overdue. I had the honor of attending the College Book Art Association (CBAA) Conference. The conference took place January 2nd-4th. It was a wonderful way to start off the year. There are a few reasons I was able to be a part of this conference. I received a travel grant to get there, I presented my thesis project, and I volunteered to waive my registration fees. I also had one of my books in the Members Exhibition and participated in the folded form exchange. Through all of my involvement I was fortunate to meet and engage with amazing educators, Book Artists, and Letterpress Printers. It is always wonderful to leave these conferences with inspiration and the juices flowing for my next project. The University of Utah has an amazing facility for their Book Arts Program. I have never seen anything like it. It is located in their library. When you arrive on the 4th floor you are in front of a glass wall. Behind this glass wall is everything letterpress! Their printshop is on display like a working museum. This is wonderful because all students on campus can see printing in action and it may entice them to take classes. 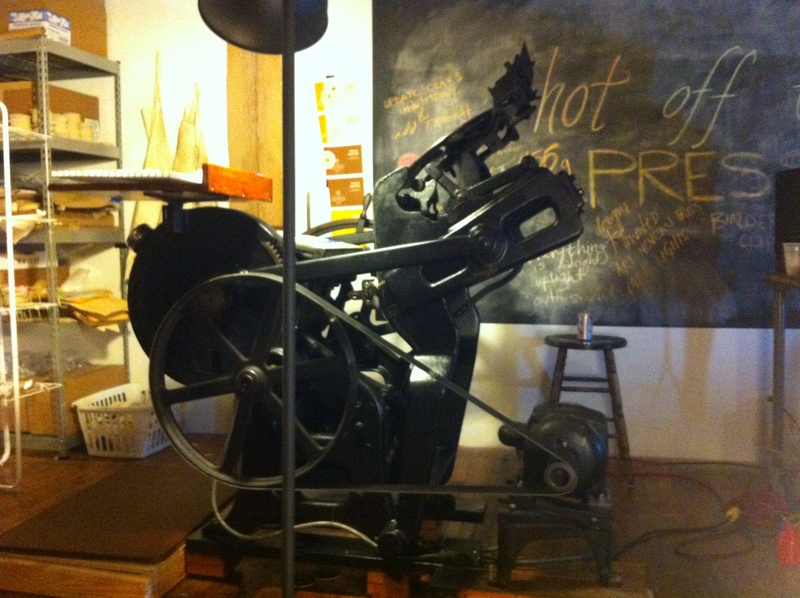 Most letterpress shops are hidden in the basement and no one knows they exist. There was so much going on at this conference. They had a vendor fair all days where Jim Croft selling his gorgeous bonefolders. 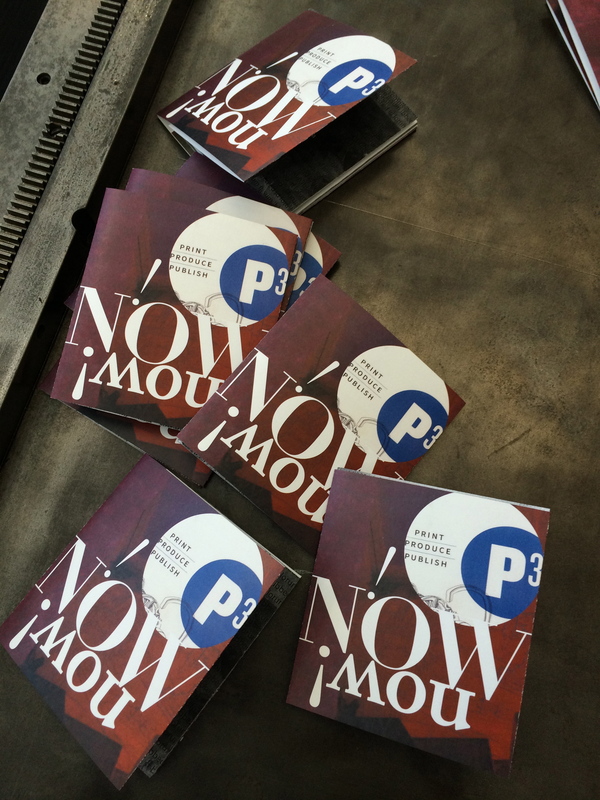 There was a book created onsite in 24hrs. The edition size was 250. Particpatants from the conference were able to contribute to it by bringing an item from their studio that could be scanned in. I assisted in the final production of the book (folding, Stapling, and trimming).Here is a picture of the final books. Everyone at the conference received a copy. There was also another ongoing project happening throughout the conference called [in code]. A group of artists go by the name Shift-lab developed this collaborative project. Here are details about the project from their website http://www.shift-lab.org [in code] is a social media inspired collaborative project by shift. 3. Watch your tweets become part of a collaborative print project. The picture to the right is one of many prints they produced. 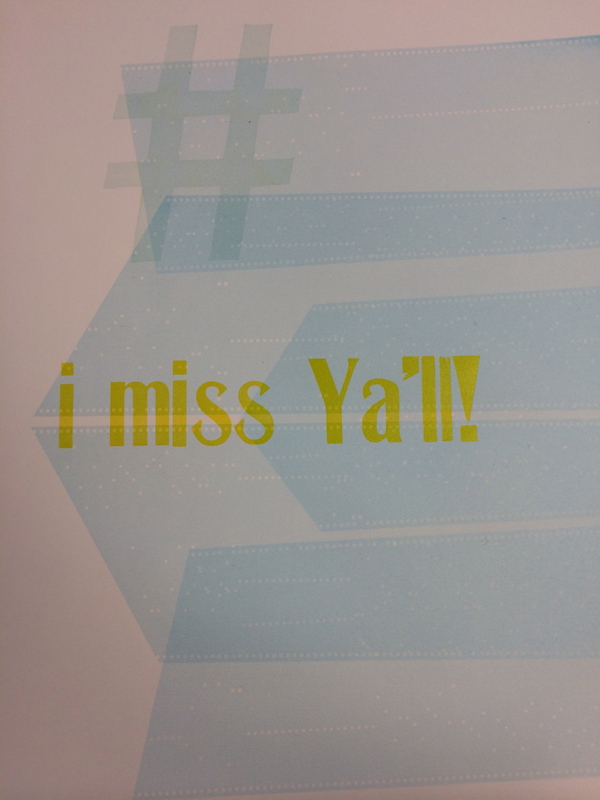 This was my last week of teaching intro to letterpress at Spudnik Press. I loved teaching in an art community environment. It is very different from teaching at a college. It definitely took a little time to adjust and realize there are no grades. These artists are here because they want to learn. What a fabulous experience. I can’t wait to teach my other classes in the near future! The next session of classes will begin January 11th. If you are interested in learning how to letterpress print you should enroll into my class there is still space. If you already know how to print but want to learn the process of polymer plate making then you can take my class in March. If you have any interest or questions please feel free to contact me or Spudnik Press. Here are some pictures of my last class hard at work. Thank you Angelika Piwowarcyk for taking beautiful pictures during class. Work in Fort Worth, Texas!! In or near Forth Worth, Texas? Go to WOCA gallery to see “Running Thoughts” a multimedia piece I created for my thesis. 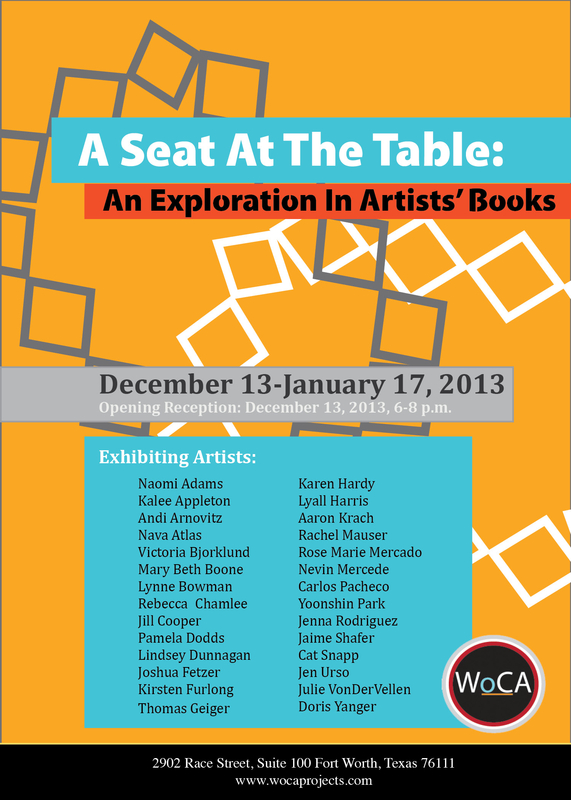 It is part of a group exhibition called “A Seat At The Table on display till January 17th. New Print Shop in Town called Tandem Felix! Husband and wife Jamiel Dado & Liz Isakson-Dado recently started Tandem Felix Letterpress Print Shop located in the Lacuna Lofts in Pilsen. Liz was a colleague of mine from grad school. They are super excited about this new edition to their family. The Lacuna Lofts and print shop are gorgeous. 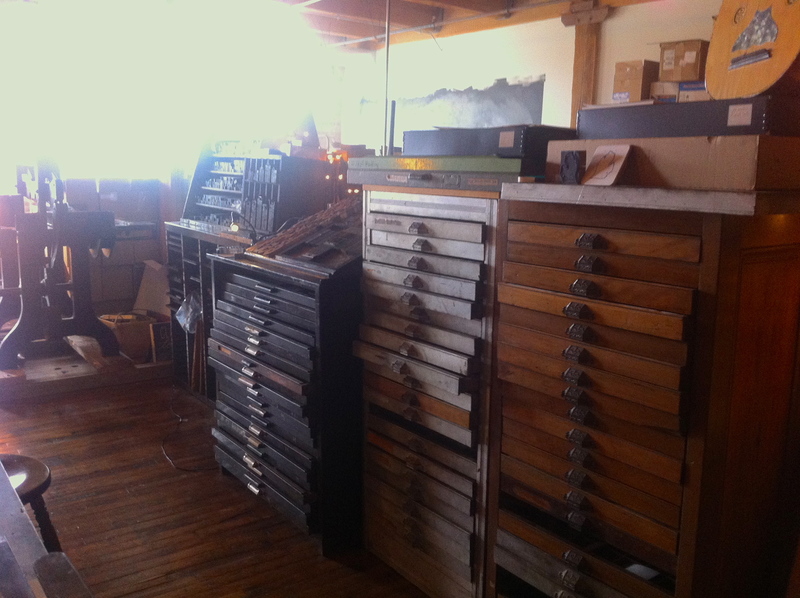 They have acquired a C&P Platen Press, Sign Press, and a good size collection of wood and metal type. They are offering a variety of workshops for anyone who is looking to get their hands inky! They are also starting to produce work to sell in their etsy shop. So far they have a variety of posters using wood type and coasters. If you have any interested in learning letterpress printing I would definitely give them a holler. Check out some pictures from my last visit. Photos are not the best and do not represent how beautiful the shop is. I guess that means you just have to go check it out for yourself! This weekend I will be walking and officially receive my MFA in Interdisciplinary Book and Paper Arts. It was a long and fast three years. (if that makes sense) Looking back I feel the time has flown by but during these three years I remember feeling the end of the tunnel was soooo far away. Now I am trying to figure out the question everyone in the past couple months has been asking me… “What is next?” As of now I am hoping and praying for a job in the near future!!! The search mission is beginning. I currently have THREE part-time jobs (I produce the Journal of Artists Books (JAB), teach art at two public schools in Chicago, and the not so fun job of waiting tables). My goal is to find ONE full time job. Oh how lovely that would be. Well that is it for now. Enjoy some pics from my thesis show!